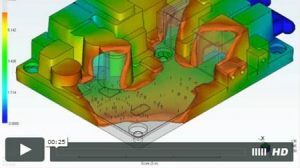 Moldflow analysis allows insight into the molding process prior to manufacturing of the mold set. It helps analyze material characteristics and behavior in areas like plastic flow, pressure drop, and fill time, increasing accuracy and saving time in the design and engineering processes. Moldflow analysis is used in each project to simulate the flow of material in the cavity and around the part to ensure a complete fill, determine the optimal injection location(s), and help address other concerns that may appear before they have a chance. This improves results and reduces the likelihood of tool modifications. See examples below of moldflow analysis computer simulations for conditions like plastic flow, pressure drop, and fill time. 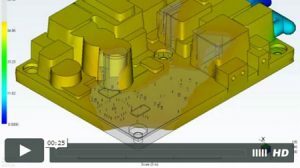 The moldflow analysis plastic flow gives us an overview of the material dynamics that generally helps determine and confirm a variety of basic factors as material is introduced into the mold set cavity. Plastic flow helps determine the best gate locations, shows the patterns where flows will meet, and simulates the flow of material in the cavity using CFD (Computational Fluid Dynamics) computer simulation. The Moldflow Analysis Pressure Drop simulation shows the pressure required to fill a cavity around the part. This assists in mold set design by helping to avoid damage to pressure sensitive parts like batteries, capacitors, LED/LCD screens, and large components. Pressure drop shows where material may ‘freeze off’ (solidify), to anticipate fill time and flow pattern. The Moldflow Analysis Fill Time simulation shows the total time to fill the mold set cavity around the part. This helps ensure a complete encapsulation before the material ‘freezes off’ (solidifies), which can affect fill time due to material re-flow. Insights obtained from moldflow analysis directly translate to mold set production. MoldMan mold sets are manufactured from high quality, aircraft grade 7075 aluminum for strength, durability, and material consistency. Cavity plates can be made from steel or hardened steel for high volume production. Prototype mold sets, made from the same high quality aluminum, will produce production quality parts and allow any modifications to be identified prior to production runs. In production mold sets, exchangeable shut-off inserts are used to reduce or eliminate tool modifications, should there be a change in wire diameter or connector size. Production mold sets also include guided ejector systems used for easy part removal. Hand placed inserts can be used to prevent material from flashing into unsealed connectors. Efficient sky lining, which forms a thin layer of material needed to protect components, while minimizing the amount of material consumption. Flexible design, as parts can be formed into just about any shape, assisting in mounting and installation. Shut-offs, used to leave exposed components where necessary for connections and non-molded areas. Integrated grommets and strain relief, incorporated into the part geometry for enhanced esthetics and time savings. 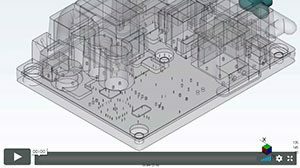 Moldflow analysis assists in the design and engineering process from concept to production, providing a product that meets or exceeds expectations. To learn more about how MoldMan moldflow analysis can be used to develop a solution for your application, contact a representative today.